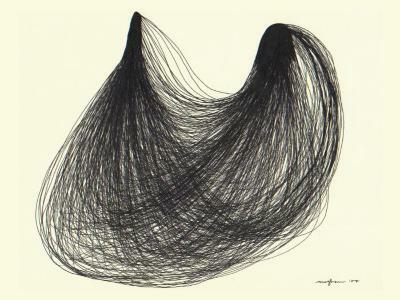 Meghan Keane, Hair Sac, Pen on cotton paper, 8.5 in X 11 in, 2007. Meghan Keane, Tangles , monoprint on Somerset paper , 6.5 in X 11 in, 2009. Meghan Keane, Nesting , monoprint and pen on cotton paper , 8.5 in X 10 in, 2009. Meghan Keane, Untitled (Quintet), pen on Arches watercolor paper , 12 in X 9 in, 2009.